Assembled in 2003 to infiltrate, build and destroy, Gatineau, QC's INSURRECTION is an aural onslaught assaulting witnesses in both languages of French and English. Known for blending calculated technicality with a signature mixture of merciless death metal, the band has emerged to be one of the most prominent Eastern Canadian metal bands. Annihilating the masses with their three previous full lengths "Prototype" (2013), "Fracture" (2010) and "Prologue" (2009), INSURRECTION is ready to once again push their metal to blasphemous levels with their next release "Extraction". A ten track aberration, ready to shock and blast fans to the next life, the album is produced by Pierre Rémillard at Wild Studio (Cryptopsy, Obliveon, Anonymus, Voivod, Krisiun, Ghoulunatics, Despised Icon, Beneath the Massacre, Gorguts, Martyr). Slated for release on October 6, 2017 via Galy Records, INSURRECTION has teamed up with NoCleanSinging.com for the premiere of their second single "Data Extracted...End Transmission", which features guest vocals from Bruno Bernier of influential Canadian progressive death/thrash metal band Obliveon. "We can’t wait for everyone to hear what we’ve got for you, and we’re honored to have Bruno Bernier of Obliveon with us.” says vocalist Stef Jomphe. Headbang to the track at the following link HERE! Album pre-order on Bandcamp HERE and Galy Records HERE! In addition to the release of their fourth album, INSURRECTION will be spreading the notoriety of their live shows across areas of Quebec, Ontario and New Brunswick in promotion of "Extraction" (dates listed below). "We are a hybrid of the best and the worst that the metal underground has to offer, completely familiar, yet hard to pin down, better categorized as the many oddly familiar faces that death metal can take." says band founder and vocalist Stef Jomphe. Pushing development to blasphemous levels and quickly spreading their notoriety to areas of Quebec and Ontario. 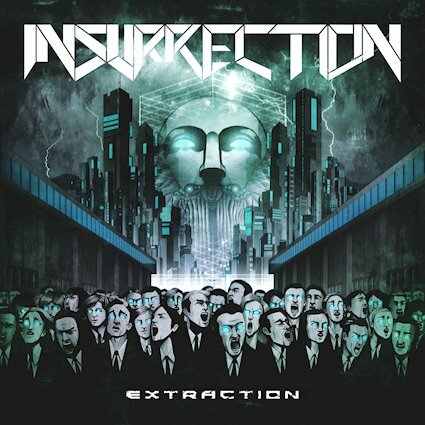 INSURRECTION continues to expand and modulate to corrupt the entire East coast of Canada returning with their new album "Extraction". A ten track aberration, ready to shock and blast fans to the next life, the album is produced by Pierre Rémillard at Wild Studio (Cryptopsy, Obliveon, Anonymus, Voivod, Krisiun, Ghoulunatics, Despised Icon, Beneath the Massacre, Gorguts, Martyr, etc) and features guest vocals from Bruno Bernier (Obliveon) on "Data Extracted ... End Transmission". The album is slated for release on October 6, 2017 via Galy Records.